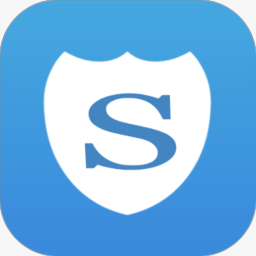 Shadow Defender solutions provide a new way to solve system security, data protection and privacy protection problems. It uses a method called Shadow Mode to protect PCs from attacking. By placing PCs in Shadow Mode with Shadow Defender, the system is going to be protected no matter what happens. Shadow Mode tracks all the change and redirects them to an unused location on the disk. These system changes can be permanently saved to disk, or completely discarded. Shadow Mode is the most efficient and intelligent way to protect PCs. Shadow Defender provides easy to use desktop security and privacy protection for Windows operating systems. It is an excellent way to prevent unwanted or malicious changes from being made to a PC. 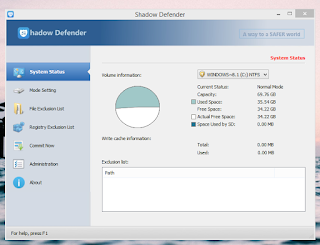 With Shadow Defender you can run system in a virtual environment, called Shadow Mode. and all the attacks will happen in the virtual environment, not the real environment. If attacks happened, all you need to do is to reboot your system. And meanwhile you can save the selected files and folders to the real environment. • Fixed: An error message 'You Need to Format the Disk before You Can Use It' when enter/exit Shadow Mode. • New: Some GUI changes. 0 Response to "Shadow Defender terbaru Mei 2018, versi 1.4.0.680"